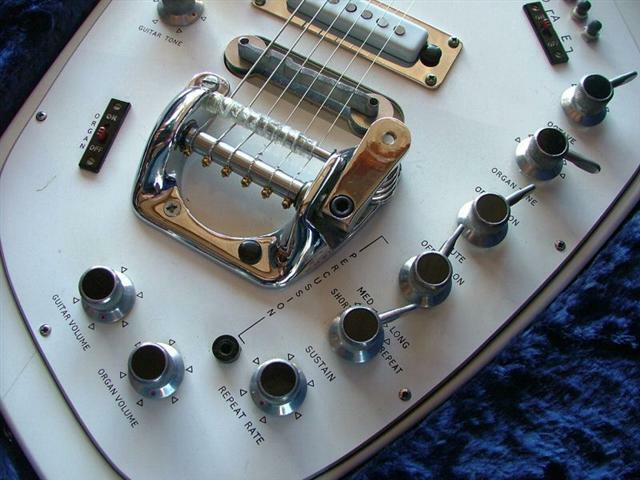 The guitar craze of the 1960’s not only made everyone want to play electric guitar, but brought guitar technology to the forefront. Musicians wanted not just to play guitar, they wanted the guitar to sound like a completely different instrument and most of all; they wanted more sustain. For years blues guitarists used crappy guitars and amplifiers and got a distorted, gritty sound that some American and UK performers thought was cool. The modern Rockers of the day wanted that down and dirty sound but would not be caught dead with a Silvertone guitar and a cheap old Danelectro amplifier. 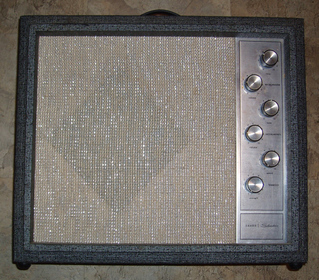 Electric guitar technology came to the rescue and it's first invention was called a fuzztone. Next came the LBP-1(Linear Power Booster) transistorized preamps, wah-wahs and a host of other bells and whistles. Taking the technology a step further there were some folks that wanted the guitar to sound like an organ. 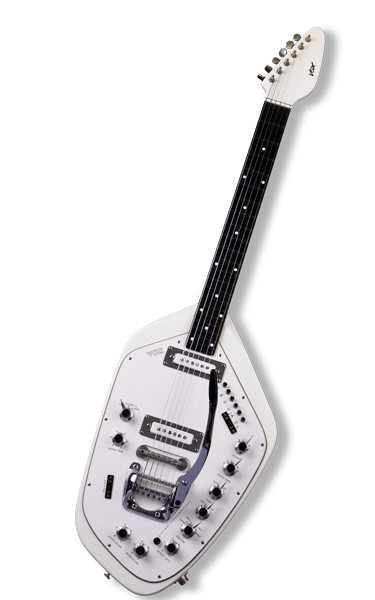 The first to develop this concept was a company located in Waco Texas known as Musiconics International (MCI) came up with the Guitorgan. This was invented by a fellow named Bob Murrell. 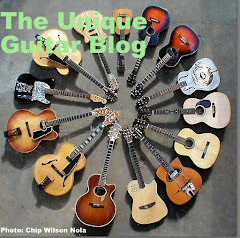 Musiconics International did not actually make the guitar. 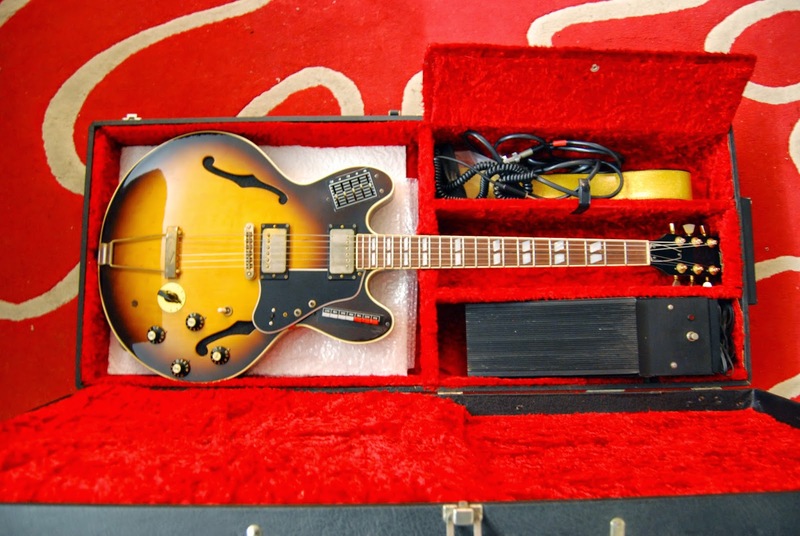 They used a semi-hollow body guitar made by the Japanese firm Univox. 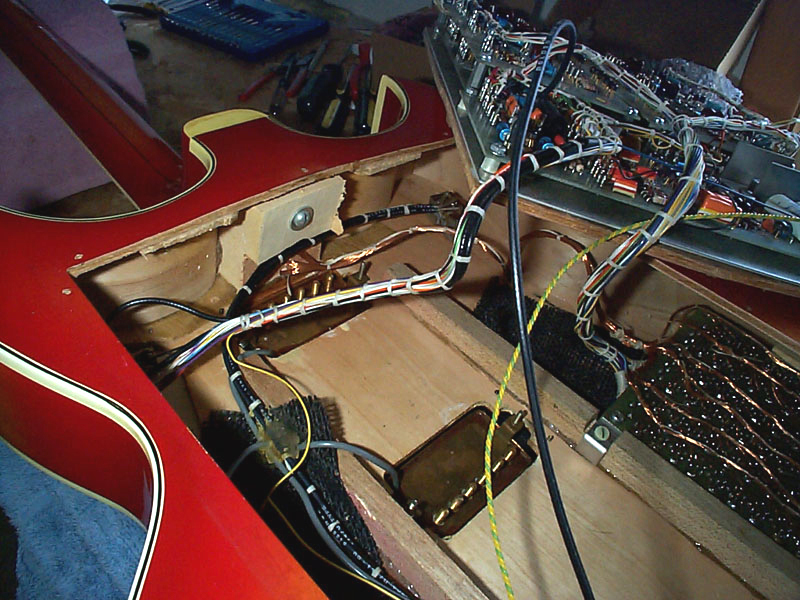 What MCI did was to route the back side of the guitar and put organ circuitry inside the instrument. The guitar was named the Guitorgan. The challenge of making the instrument work was to divide each fret into six segments and attach wires through the neck which connected to each segment of the fret. So the average 22 fret instrument must have housed 132 wires and connections. Each fret was now a contact switch. The guitar sound would be produced through the single coil pickups as usual; however depressing the string on the fret also initiated contact to the organ section since pressing the fret was like pressing an on/off button switches. This caused the ground connection to produce output similar to pressing the keyboard on a conventional organ to produce the sound. The organ sounds used transistorized oscillators. As the years progressed Murrell was constantly upgrading his invention. The last version from the 1980’s included an analog synthesizer and a MIDI connector. One could have just the organ sound, just the guitar sound or a mixture of both sounds. Musiconics built about 3,000 units. There were two issues with the guitorgan and subsequent products. With a regular guitar there is a note on each string between the nut and first fret. However there was no wires going to the nut. So instead of the first organ note on the first string being F, it was F# since the first actual fret was wired. Guitarists compensated for this by tuning down a half-step. The other issue was only the highest fret segment played on a particular string would sound. And though the organ section in a Guitorgan is a 6-note polyphonic circuit. This allows full guitar chords to be played the organ notes can only be played alone or simultaneously with the guitar. The idea was to use the expression pedal in such a fashion to bring the organ in or out but have the guitar be the primary sound giving the illusion of a duo, but actually just being one musician. In 1976 and Italian company known as Sisme which produced Godwin Organs came up with a product they called The Organ. As we may discussed with the Wandre guitar, Italian made guitars seem to possess an accordion-like quality. They all seem to have sparkly designs, use of celluloid coverings and lots of buttons. The Godwin (guitar) Organ was no exception. It certainly looked impressive since the controls covered the entire bottom side of the instrument. Users claim it produces a sound similar to a Hammond organ, especially if fed into a Leslie rotary speaker. Like the Hammonds drawbars, which emphasize different overtones produced by the tonewheels that produce the percussive like sound. The Goodwin Guitar-Organ utilizes rotary knobs for this purpose. The instrument also has had slow/fast vibrato with an on/off switch so that even without the Leslie, you can get a pretty good impression. The Godwin Guitar-Organ has 19 switches and 13 knobs. They also produced a lower cost model with 16 switches and 4 knobs. 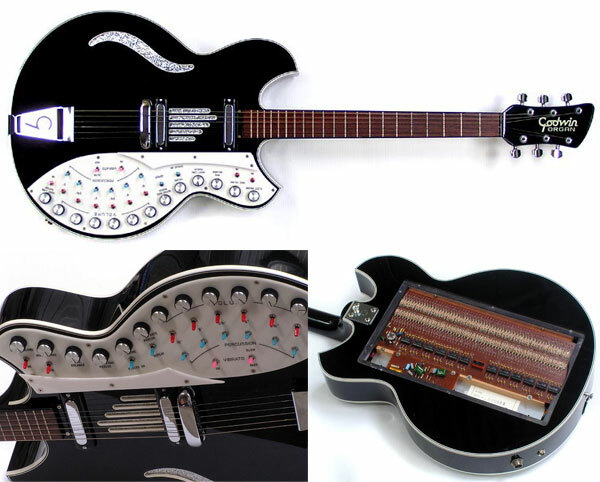 The Vox Company, which was made popular due to the Beatles association with Vox amplifiers produced their own version, known as the Guitar Organ (without the hyphen). The electronic circuit was based on their Vox Continential organ Voice Boards. 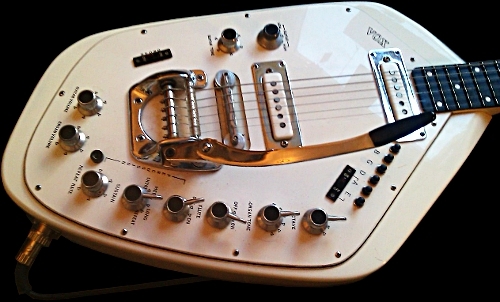 The body of the Vox was based on their Phantom style guitar. Most Vox guitars were manufactured in Italy. Like the other instruments the Vox Guitar Organ could be played as a guitar or as an organ or blended between the two instruments. It was also possible to get organ rhythm behind the guitar melody. This was due to the feature that played automatic chords in rhythm with your song. The instrument also featured two inputs to amplifiers. There were also features to provide sustain and percussion. The Vox Guitar Organ had a power supply interface to provide power to the organ section. The guitar organ became obsolete when the age of the guitar synthesizer came into the picture along with the hex-pickup. The bit about the requirement for half-step down tuning is completely inaccurate. The first fret on a Guitorgan (and the other organ guitars) plays an F on the low E string. The Guitorgan actually has a button on the back of the neck to play the open strings for the use of open chords. And the fact that only the highest organ note played on each string will sound is not an "issue" as you put it; it is actually a key feature of the design. If multiple notes on a string were sounding at once, how could you play anything without triggering at least one or even two unintended notes from sounding on that string?? Oh, and the organ on a Guitorgan (MCI) only goes up to the 17th fret. Other than these small corrections, I think you pretty much summed up the history of the organ guitar, although the Vox should have been discussed before the Godwin. And I can speak on behalf of the Godwin->Leslie 145 setup. It's amazing!! Some of your pictures are incorrectly annotated as the Vox guitar organ but they are a different instrument. I owned a Voc V-251 and made a couple of records with it. searching for a guitorgan power supply. Can anyone help? I don't have one to sell, but I could custom build you one (assuming you have the same Guitorgan I just got onto my bench). Or, I could share the schematic with you and you can make your own! My Vox Guitar Organ YouTube video is linked at the bottom of this page - and coincidentally my red B-35 Guitorgan is pictured at the very top of this page. Having owned both, I can say that the Vox Guitar Organ is 100% cooler and 100% more problematic. 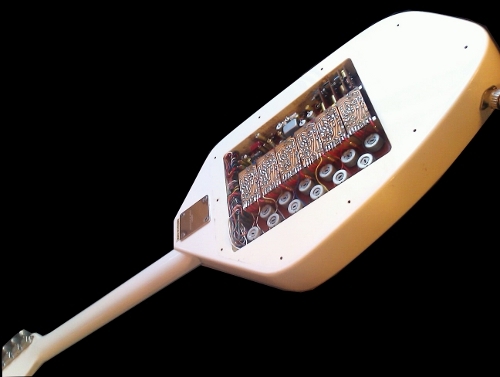 It's just a very crude instrument with a huge wide aluminum neck and overcomplicated electronics. The Guitorgan, on the other hand is a very well-made guitar, plays great as a guitar or organ and more usable as an instrument. The B-35 models (last type made) are quite nice looking ES-345 copies as well. I have just purchased a Godwin Guitar Organ as well, so I hope to report back with a true test between the three types of guitar/organ hybrids. I have a white GUITORGAN in "OK" condition that works but definitely needs some restoration. 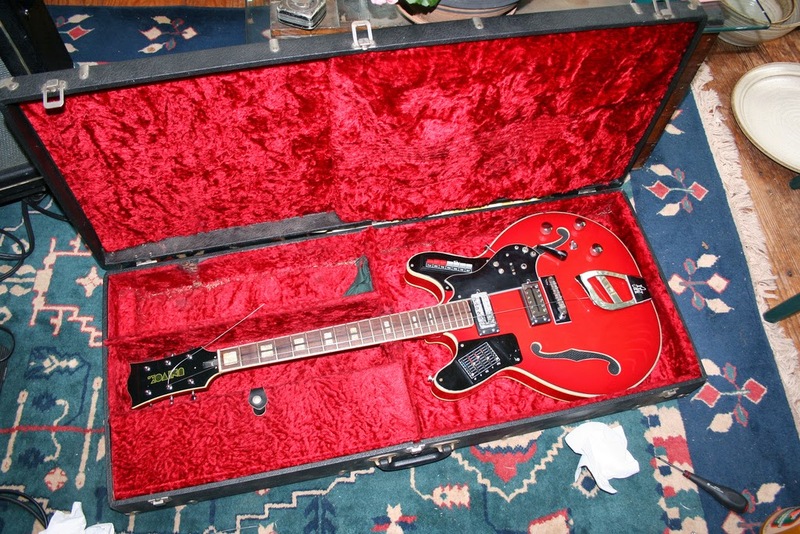 the original case is not in very good shape, but the guitorgan worked when i last played it. the power supply is there in the case, and there's no structural damage to the guitar. it just hasn't been played in a while. it was previously owned by FRDD FRITH, who sold it to me in 1987. i'd had it almost 30 years and played it maybe 3 times, in the recording studio. it's been in storage ever since.